This is a sponsored conversation written by me on behalf of Hillshire Brands Company. The opinions and text are all mine. Baked Ham and Brie in Puff Pastry. Creamy brie is wrapped in Black Forest Ham, then wrapped in puff pastry and baked until golden brown. 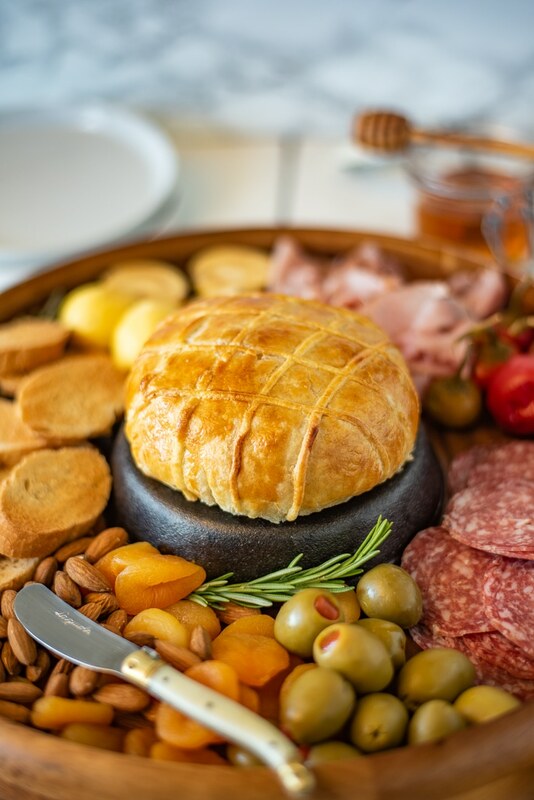 Serve on a board with all of your charcuterie items and you have an easy entertaining platter. We’re thinking outside the sandwich box when it comes to deli ham and I have a creative way to use HillshireFarm® lunchmeat for an elegant and easy appetizer. I always like to have a delicious variety of deli meats and cheeses on my charcuterie platter along with olives, dried fruit, nuts and toasted French bread. The more variety the better. But instead of just mixing everything together, I like to have a star of the show that stands out, and for this charcuterie, it is baked brie. This is not just a plain wheel of brie mixed into the array of goodies. 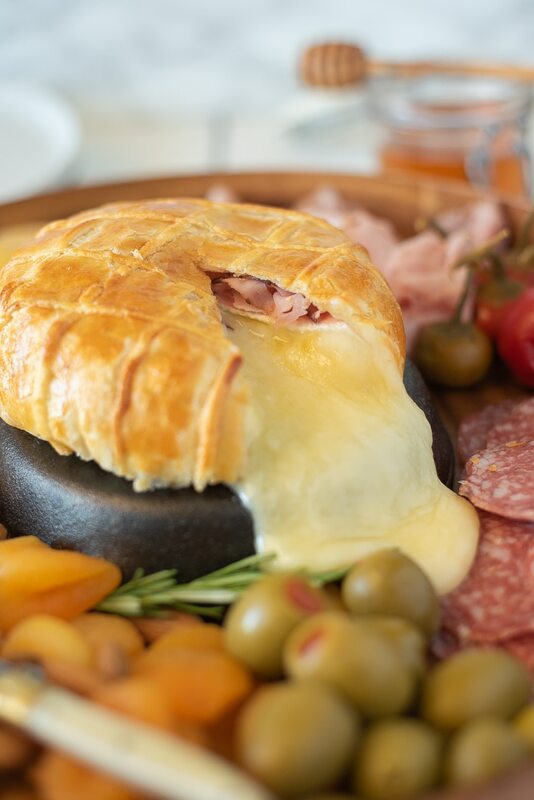 This brie has been dressed to the nines by being wrapped in Hillshire Farm Black Forest Ham and puff pastry. 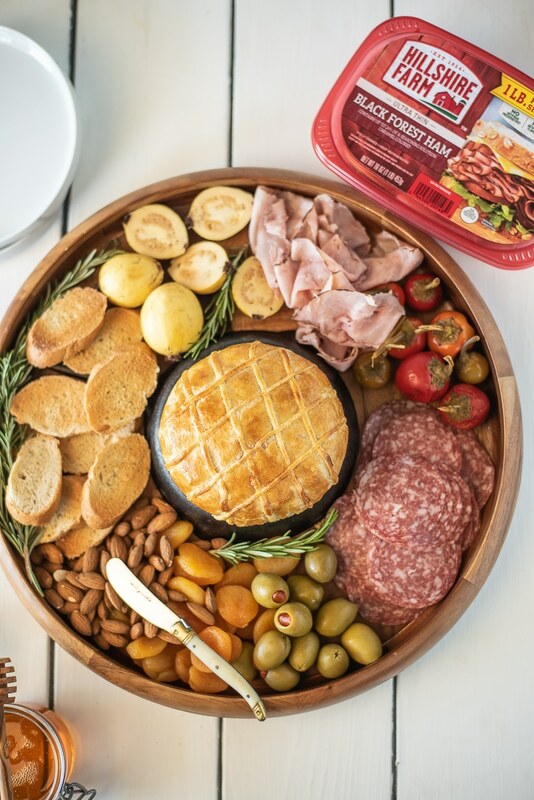 Black Forest Ham adds a wonderful, smoky, element to the baked brie and comes with zero guilt because this lunchmeat is made with no artificial flavors, no preservatives, no added nitrates or nitrites. I found all of the ingredients for this recipe at Walmart, but did you know that you can shop for your ingredients right from your own phone then pick everything up when you arrive to the store? We can thank Online Grocery Pickup for this. 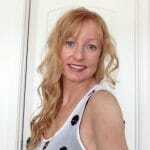 OGP enables anyone to use their smartphone app to shop from anywhere. All you have to do is drive Walmart and pick up your groceries that are all ready to go. No more walking around all the aisles, have someone else do that for you. I also have an Ibotta coupon for you, just click here > coupon. With the weather warming up, it’s all about friends, family and entertaining with cold beverages and good company. This baked brie is an appetizer that can be assembled ahead and baked right before your guests arrive. They will think you bought it from a gourmet bakery, but only you will know. 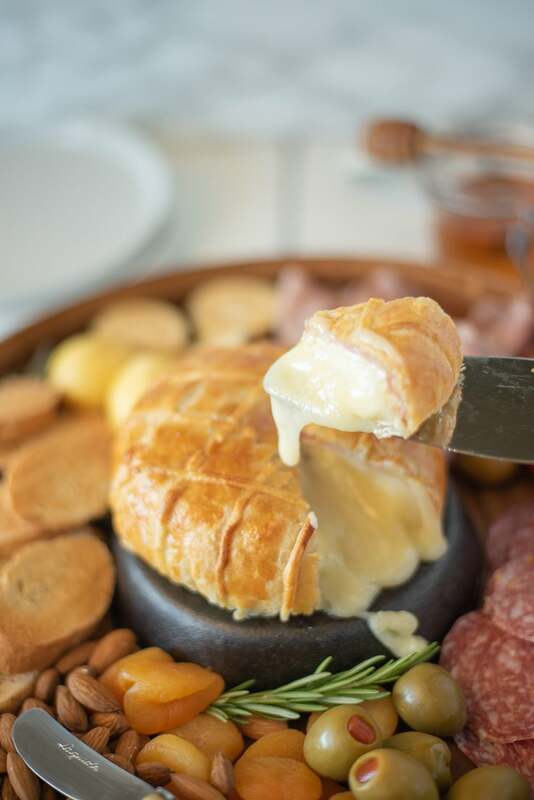 This baked brie also comes with a wow factor and that comes in the form of runny, melted cheese. When you cut into the crispy pastry and remove a slice, you see the delicious Black Forest Ham exposed, then the cheese starts to run and gets everyone excited. The soft, melted brie along with a piece of ham is perfect for spreading on those crusty pieces of French bread. Try with a little drizzle of honey, it is a wonderful taste sensation. Even though this baked brie looks like it was purchased from a bakery, it is so easy to prepare and I’ll show you how in these easy steps. Place the brie onto a cutting board. Lay 4 slices of ham over the brie starting on the top and tuck underneath. Roll out the puff pastry dough so there is 3 1/3 inches all around. Place the ham covered brie in the center and neatly wrap the pastry around with the seam on the bottom. Trim any excess pastry so it can sit flat. For those extra pieces? Create strips and make a pretty diamond pattern on the top. Then simply brush with egg wash and bake until golden brown. The decoration is really up to you, depending on how creative you want to be. You can just simply cut slices into the pastry to create a diamond pattern, or go the one step further like I did. When the brie comes out of the oven, allow it to rest for about 10 minutes. I found this was the perfect amount of time so the cheese is not too runny, just melted enough to create that slow flowing fountain of cheese. With the brie being the star of the show, I wanted to raise it above everything else on the platter so I elevated it on a small bowl. This also gives the cheese a chance to create a lovely cascading effect. 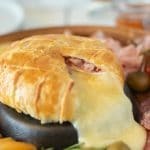 If you’ve tried this Baked Ham and Brie in Puff Pastry or any other recipe on the blog then don’t forget to rate the recipe and let me know how you got on in the comments below. I love to hear from my readers! You can also FOLLOW ME on FACEBOOK, TWITTER, INSTAGRAM and PINTEREST to see daily recipe updates. 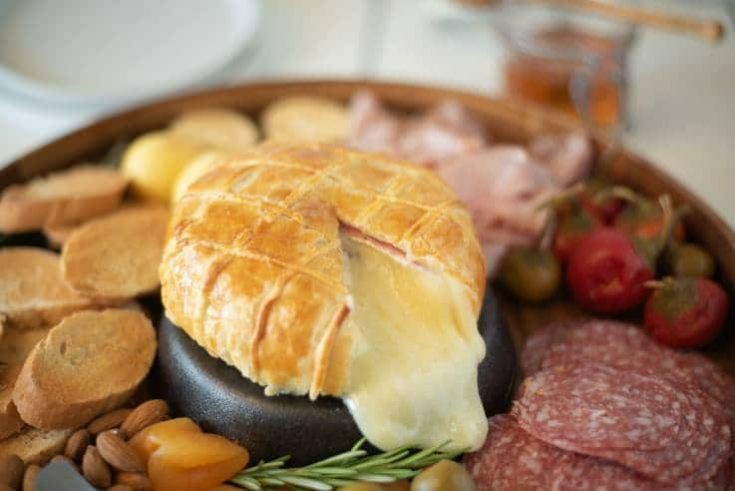 Creamy brie is wrapped in Black Forest Ham, then wrapped in puff pastry and baked until golden brown. Flour a clean countertop and roll out the puff pastry so there is 3 ½ inch border around the brie when placed in the center. Place the brie in the center and smoothly fold the pastry around with the seam on the bottom, trimming off excess underneath as needed. 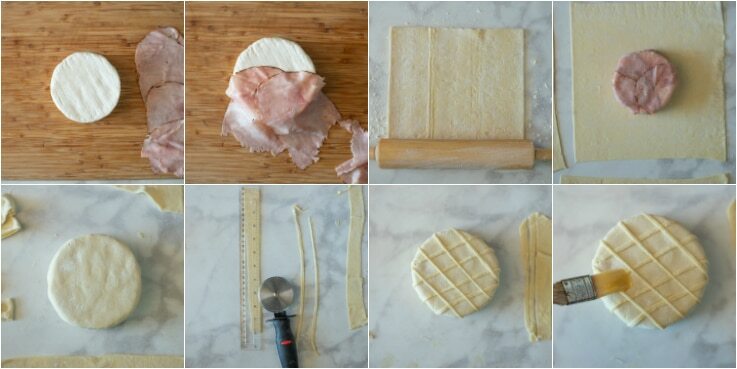 Make thin strips of pastry using a ruler and pizza cutter. Lay them diagonally across the pastry to create a diamond pattern. Brush the egg wash all over the pastry. Place the brie on a parchment lined baking sheet for and bake 25 minutes until golden brown. Allow to sit for 10 minutes before slicing. OMG! I love Ham and Cheese! This looks way too good not to try! Pinned! Brie is my fav! This is the perfect appetizer! You had me at ham and brie! I love the design you used for the pastry! So simple but so elegant! This is a great idea, even for picky eaters! It is really impressive. Looks very tasty. Yum. I can’t WAIT to try this! Thank you for this great recipe!